Belfry and town hall. A belfry is a typically Flemish edifice and symbolizes the wealth and independence of a town. 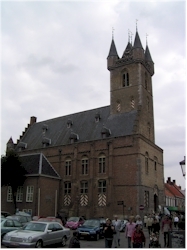 Shortly after its foundation, Sluis already attained great prosperity and soon plans were made to build a stately hall with an adjoining belfry tower. It's noteworthly that Sluis has the only belfry in the whole of the Netherlands; it shouldn't be a surprise that this graceful tower has become the symbol of the town. Another remarkable curiosity: did you know that the most well-known inhabitant of Sluis lives in the tower? He is called "Jantje van Sluis". His story goes back to the 80 years war and has been immortalized by a statue that you can see in one of the windows of the tower. It is possible to climb to the top of the belfry. Inside the town hall you can find a museum and the VVV (Tourist Office) [more information]. Town walls. Since its foundation, it took Sluis barely a few decades to turn into one of the most important ports in the Netherlands. This was mainly due to the proximity of Bruges and its strategic location at the estuary of the Zwin. The town enjoyed its greatest prosperity at the end of the 14th century. Sluis was important and such a crucial asset had to be properly protected. The first reinforcements were done in that 14th century. The fortifications that we can still see today however, date back to the period of the 80 years war and are mainly intact. There is a walking trail on the walls that takes you around the town and from where you have a good view on the gates, ditches, walls and surrounding flatlands [more information]. Windmill "De Brak". 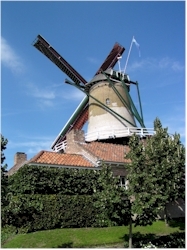 The windmill "De Brak", also simply referred to as the mill of Sluis, owes its name to a breed of French foxhounds called "Braque". It's a stone flour mill and only one remaining in the town. The Brak was constructed in 1739 and remained operational until the seventies of the 20th century. At the end of the Second World War, the town was heavily bombed, severely damaging the mill. Fortunately it was rebuilt afterwards (in 1951). Restoration works were performed in 1982 which make that it is still in working condition. In the adjacent buildings (the former mechanical mill) there is a tea-room/restaurant and a gift shop. A museum has been established in the mill itself (access via the gift shop). Ruins of the Saint-John's church. The former church used to be one of the largest in the area and dated back to the 14th century. It was heavily damaged during the 80 years war (1568 - 1648) but repaired afterwards. In 1811 however it fell beyond repair after a heavy fire and was torn down completely. Only the foundations are still visible. Kruisdijkschans. During the 80 years war, the borderland between the Northern and Southern Netherlands was protected by numerous reinforced towns, fortifications and entrenchments. On the Belgian side unfortunately rather little remains of that era. 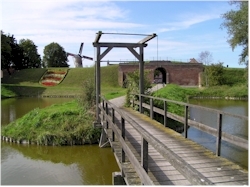 On the Dutch side however, several forts have been restored and even completely rebuilt. The entrenchment of Kruisdijkschans is a nice example of such a restoration. It was constructed near the end of the war with Spain in 1640 but remained operational for more than a century afterwards. Later it ended up in private hands. The small fort is built on a square ground plan and is surrounded by two ditches. 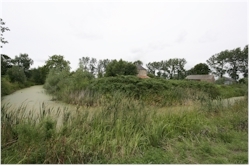 Besides the historical importance, it also is an interesting biotope for wildlife, notably for amphibians. Important: the fortification is private property, so please do not enter without permission of the owner. » How to get to Sluis?